You are getting verrrrryyyyy sleeeeeeepy. Or, maybe you're not. That pendulum isn't moving, so I doubt your eyes would be following it and getting heavy. Oops. 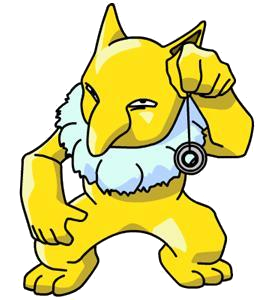 Regardless, Hypno has the requisite fantastic Special rating that all the heavily overpowered Psychics have in the first game. It's also the "defensive" Psychic Pokemon, which sadly means it has decent HP and okay Defense. Hey, that Psychic type was broken enough as it is. Had to make 'em only so-so in a few traits. Move wise, Hypno's "signature" combo is to use Hypnosis and then Dream Eater. While the idea of eating someone's dreams sounds delicious (unless they're dreaming about battery acid, or something), Hypnosis unfortunately only works 60% of the time, and Dream Eater works 0% of the time unless your opponent is asleep. So that's kind of annoying. Psychic should FO SHO be on your Hypno, because Psychic should be on any Pokemon that can learn it. While you still can use Hypnosis, I'd rather use the 100% accurate Thunder Wave. Paralysis is not nearly as good as sleep, but dat accuracy, doe. The other two moves can be any combination of Reflect, Seismic Toss, Double Team, or Hypnosis if you must. That way you can get both annoyance and solid damage against any opponent not weak against Psychic. The main reason Hypno is this high, though? That adorable little beard/ascot thing it's got going on around its neck. Just looks so warm and fuzzy. And in the cold, cruel world of Pokemon, sometimes you need a little fuzz.